Officials from the office of Homeland Security and the Massachusetts State Police conducted a joint raid in Lawrence last Thursday at the corner of Bailey and Phillips Street taking two into custody during the multi-jurisdictional drug operation. 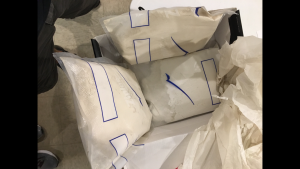 Officials tell the Valley Patriot that they confiscated 2 kilos of the deadly substance fentanyl and a kilo of heroin at the location during the arrest. Valley Patriot news spotters say the raid began in the late afternoon shortly after an SUV with Florida plates pulled into the driveway and the occupants entered the house. That’s when state police and homeland security surrounded the house and used a battering ram to break down the door to enter the dwelling. A Valley Patriot reporter on the scene said the operation went on for more than four hours as law enforcement scoured the home and removed evidence, arresting two people on multiple drug warrants. Law enforcement officials say the department of Homeland Security would be issuing a public statement Friday afternoon but that statement never came. The Valley Patriot will release more information when it is safe to do so.